In this Ableton Live video tutorial, we’ll explore some techniques inspired by two incredible conversations I had this past week. We will look at the creative possibilities of using the Simpler, some portamento, LFO, and delays, and we’ll also explore a great technique for crafting 8 bar drum patterns. First up, I had the great pleasure of catching Dorian Concept‘s insanely inspiring set at Low End Theory last week. 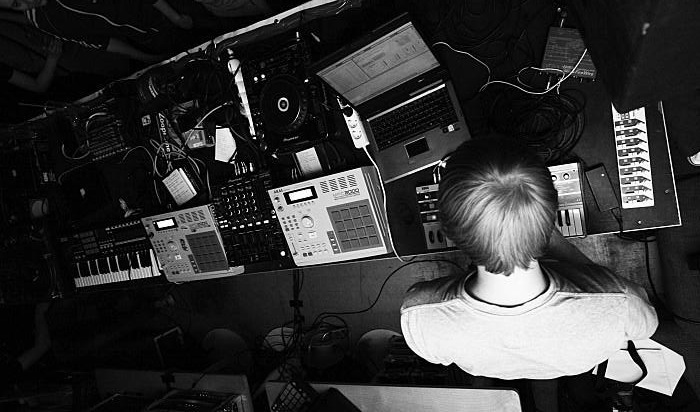 Dorian Concept is a Vienna-based producer who has developed his own completely original style of keyboard playing. He’s been tearing it up at Festivals around the world since bursting on to everyone’s radar with the massive tune Vertical Output a few years back. His latest release on Ninja Tune is called Her Tears Taste Like Pears, full of funky, synth driven club heaters. He often sits in live improv style with his friend Flying Lotus when they cross paths internationally, and his series of YouTube videos ‘Fooling Around With The MicroKorg, Alesis Micron, etc’ are straight jaw droppers. So I had the honor of chatting with him at length at Low End, and I thought I’d share some tidbits from our inspiring conversation. He shared some serious wisdom that would be helpful for any aspiring producer. Turns out he is not classically trained, and he’s actually completely self-taught. The great thing about what he has done, is that he has kept it simple and really mastered his instrument, developing his own unique style. With all the tools we have available in our toolbox these days, it is easy to get overwhelmed and the reality is that sometimes it is better to simplify and limit yourself. That is what he has done, truly mastering his Microkorg and Micron and developing his own very distinct style of playing these instruments. We talked about our shared admiration of Squarepusher, as he had a very similar approach, mainly he used one particular sampler for all of his pre-year 2000 productions. He also developed his own very recognizable style of bass playing. Applying these concepts to working in Ableton Live, I strongly recommend finding a compositional process that works best for you. These tutorial videos are about sharing various production techniques, find the ones that give you the best results and develop them further. Put a few of these techniques together into your bag of tricks, and then work at becoming the master of them. Identify a few elements that will become your signature sound, and then create a body of work with them. Develop your meat grinder, and then crank out the jams. Stay tuned for the next tutorial, in which Professor Nalepa shares some great tips and techniques for drum programming and sequencing he picked up from Dutty Artz co-founder and Dubspot Instructor Matt Shadetek. The track used at the end of this video is “Wonton Garden” from Matt Shadetek’s Dutty House EP, out now on Dutty Artz. Hey i Sat in on the Sessions In boston It was great to meet you and I found the seminars very resourceful!